Events Online offers remotely delivered instructor-led training, often called ‘webinars’ or ‘synchronous’ web-based training. This means you can get the training you need without having to travel. Using any web conferencing software such as WebEx, GoToMeeting, or Join.me, Events Online instructors train new concepts, demonstrate new tasks, and give students opportunities to practice and receive feedback on their practice sessions—all from their desktop. 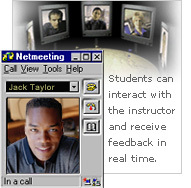 Events Online has been designing and delivering engaging virtual classroom instruction via the web for over ten years. Great instructors, excellent support materials and top-of-the-line instructional design make first-rate courses, and that’s what Events Online is delivering to clients such as Hewlett-Packard and Agilent Technologies. We develop custom classes and offer training on standard software packages such as Microsoft’s Office.